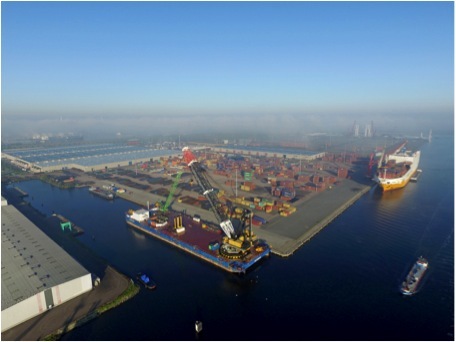 Dutch Offshore Base has an open sea accessible, strategic and ISPS and AEN location in the main port of Amsterdam. There are lay-by facilities for (marine, sea-going and jack up) vessels and there is 800 m of quays available, with a deepsea quay of up to 500 m length, 60 m breadth and 15 m draft. Dutch Offshore Base offers heavy lift crane capacity up to 1400 ton, a large open yard area of more than 100,000 sqm and warehouse space of 30,000sqm.